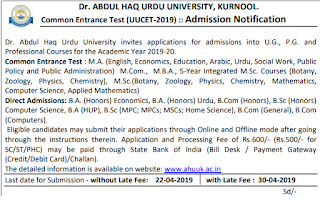 UUCET Notification 2019: Dr. Abdul Haq Urdu University, Kurnool invites online and Offline applications from Degree qualified candidates for the admissions in to PG Courses and integrated PG Courses. Official website to for this UUCET 2019 online form submission is www.ahuuk.ac.in. 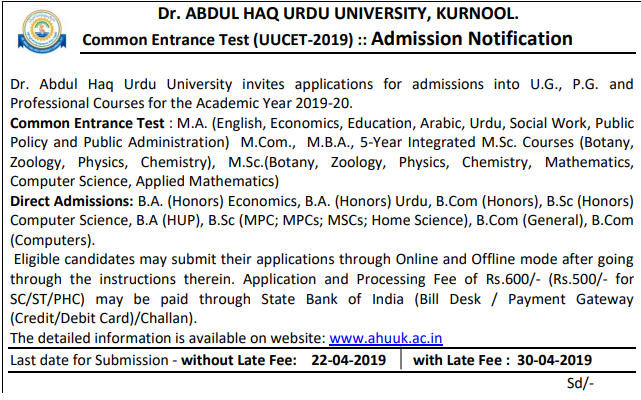 Apply online for Dr. Abdul Haq Urdu University, Kurnool Post Graduate Common Entrance Test 2019 from 22-03-2019 to 22-04-2019. Candidates who are looking for UG courses of BA, B.Com and B.Sc courses they can apply directly using online of offline for Urdu University UG Courses. Written exam for this UUCET 2019 will be conducted in the month of June 2019. UUCET 2019 Hall Tickets, Exam pattern, UG Courses application, UUCET Exam wise syllabus of this Dr. Abdul Haq Urdu University, Kurnool Post Graduate Common Entrance Test 2019 is updated below. For PG Courses degree qualified candidates are eligible to apply for this Dr. Abdul Haq Urdu University, Kurnool Common Entrance Test. For UG Courses/5 Years Integrated PG courses Intermediate qualified candidates are eligible to apply. For Exam Centers refer notification. For UUCET application fee is Rs.600/- and Rs.500/- for SC/ST/PHC candidates. Written exam will be conducted for 100 Marks and consists of 3 sections. For PG Courses Degree syllabus is applicable. For Integrated courses Intermediate syllabus is applicable. UUCET 2019 Hall Tickets are available 10 days before the exam date. Candidates who wanted to groom their career with Urdu University they can apply online for this UUCET 2019 on or before 22-04-2019. Official website for this UUCET 2019 online form submission is www.ahuuk.ac.in.